Kimstim is proud to present this collection of short films from one of the world's greatest stop-motion animators: Kihachiro Kawamoto. Famous for his beautiful, expressive puppets, Kawamoto began his career in the 1950s. Honing his skills at the legendary Kratky Studios in Prague (under the mentorship of celebrated Czech animator Jiri Trnka), Kawamoto harnessed Japan's unique aesthetic traditions to create visually stunning stories. 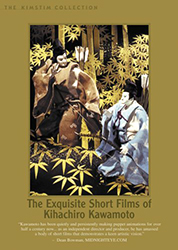 Drawing on ancient legends, contemporary short novels, as well as Noh, Kabuki, and Bunraku doll theater, Kawamoto's haunting, poetic films speak of passion and loss in worlds populated by ghosts and demons. All films are in Japanese with optional English subtitles, unless otherwise noted. A pair of hunters encounter a ghastly demon in the woods. Escaping by severing the apparition's arm, they make an even more grisly discovery on the journey home. Based on the 12th-century Japanese medieval legend Konjaku-monogatari. A dog race is interrupted by a ringmaster who attaches fish to the animals' collars and makes them run in circles. The crowd becomes incensed and the ringmaster finds himself in a race for his life. A young girl sets off on a surreal metaphysical voyage through which she will learn all the pain and joy of life. A mysterious meditation on the power of poetic imagination. A worker fired from a factory for demanding higher wages is plagued by ghastly nightmares. Based on a story by novelist Kobo Abe. Two pilgrims, an elderly monk and his young disciple, out on a spiritual journey, encounter a mysterious woman whose frenzied passions transform her into a huge white serpent. A Japanese "Drama of the Absurd." A young village woman is torn between two suitors. Out of anguish, she decides to destroy herself. Although her intentions are pure, her death reverberates with shocking consequences.